After his departure from Deep Purple in the summer of 1973 Ian Gillan spent some time in a musical wilderness before forming Ian Gillan Band in late 1975. This part of his career has been well documented on other Angel Air releases, in particular “Live At The Rainbow” (SJPCD017). Ian Gillan Band released three studio albums but Ian sensed that their brand of complicated jazz-rock was in danger of alienating his core audience. 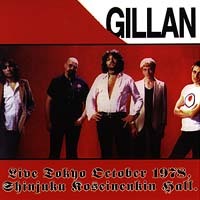 Accordingly, he decided to form a new band which became Gillan. This featured John McCoy, Steve Byrd, Colin Towns and Pete Barnacle. One of their first engagements was in October 1978, a four-date mini-tour of Japan plus TV appearances. The concluding show, at Tokyo’s Shinjuku Koseinenkin Hall is featured on this CD. If fans had despaired that Ian Gillan was deserting his rock roots they needn’t have worried when listening to this concert. This recording proved to be the foundation for a very successful four-year period that followed. ...this release is one of the earliest recorded moments (and the first time on CD) of the newly formed Gillan line-up...A must for all Gillan fans despite the bootleg quality. If you belong to the true Purple (Gillan) fans, then don't miss this interesting live gig with nice covers of 'Smoke On The Water' and 'Child In Time'. A new band built around keyboard player Colin Towns crashes through a set dominated by the latest album, Gillan, but finds room, too, for a couple of old Deep Purple chest-beaters…An excellent booklet adds to the fun. …a real gem…a live set to die for. Great material and enjoyable sleeve notes make this a top-notch effort. Overall, a really good recording of the band's mini-tour of Japan. In fact, I'll say it's nearly comparable to a live Purple show…Damn, is it just me or does this disc rock? Nifty twelve page booklet with well written liner notes and interesting memorabilia.